Kevin Varty from NSW has taken out Round 13 of the Hobie Kayak Bream Series with 6 Bream for 4.03kg while Brett Crowe took second with his bag of 5 for 3.95kg Both anglers have now qualified for the Grand Final in Western Australia as well as a place on the Australian team heading to the Netherlands to compete in the 4th Hobie Fishing World Championships next month. 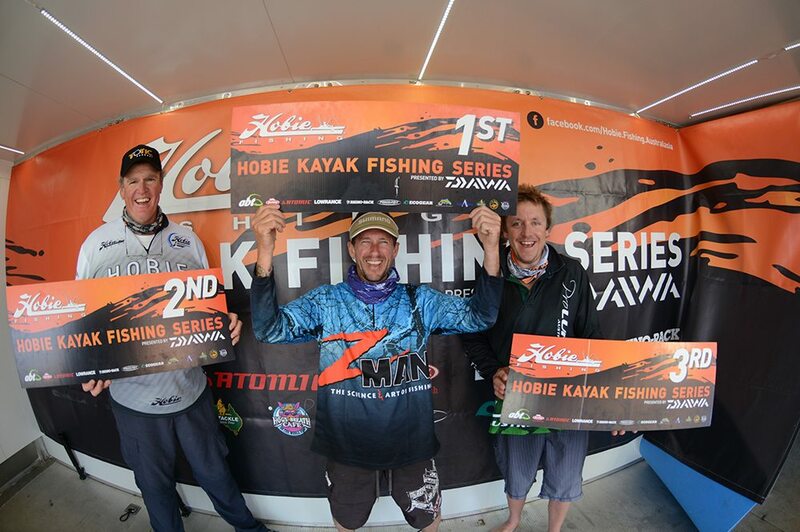 Over the September 13-14 weekend the NSW south coast waterway of St Georges Basin was the venue for round 13 of the Hobie® Kayak Bream Series from which two anglers qualified for places in the 2014 Hobie Kayak Bream Series Grand Final presented by Daiwa. The top two finishers also won places in the Australian squad to compete in the Hobie Fishing World Championships presented by Rhino-Rack which will be held in the Netherlands from October 5-11. St Georges Basin is located in the Shoalhaven just 2.5hrs south of Australia’s largest city, Sydney and 2.5hrs east of Canberra the capital of Australia. Nestled just minutes away from Jervis Bay’s pristine, white sandy beaches and deep, blue waters is the Yellow Fin Bream fishery of “The Basin” with its dark lake waters, small islands and meandering tidal opening to the ocean at Sussex Inlet. The region surrounding “The Basin” is the home of the Hobie Cat Australasia factory and the heart of Hobie in the Asia Pacific. Being Hobie’s home region and its proximity to large populations, its magnificent surrounding environment and abundant wildlife the absolutely superb fishing arena of “The Basin” was surely the perfect location to hold one of the most prestigious events on the Hobie Fishing Series calendar. On the morning of day one competing anglers pedaled off from the Power-Pole starting line in overcast conditions, which began to clear later in the day. Anglers were chasing bream with a bag limit of three fish to be brought back to the Berkley Bump Tub. As the day one session came to a close on the calm waters of The Basin, the impressive field of 48 anglers began to accumulate and throw their final casts around the Atomic Launch site at Palm Beach. Fishing throughout the day was fairly tough although around half the field still bagged their three legal bream but upgrades were scarce in most locations across the tournament arena. For most competitors the fish were on the bite early but became more timid in the calm conditions and as the light began to break through the clouds later in the session. At the completion of the weigh-in, James Kilpatrick from Belmont in NSW was leading the field with a 2.92kg bag, comfortably ahead of the 2.24kg bag of Brett Crowe from Vincentia in NSW and Kane Terry from NSW whose 2.22 kg bag placed him in third with a day to go in the tournament. Jason Lambert from NSW was leading the Hog’s Breath Cafe Boss Hog Big Bream with the biggest fish of day one which weighed in at 1.61kg. Hoping to improve on their day one catch anglers were faced with conditions that were vastly different to the previous day, with clear blue skies and temperatures ranging up to 22ºC. An unpredictable, cold wind picked up from an almost calm breeze at the Power-Pole Starting Line to a fluctuating 20kph breeze that was blowing from different directions around the arena throughout the day. After two long days on the water and with all anglers safely back at the tournament location, bags were removed from the Berkley Bump Tub and placed on the scales for the final weigh-in. After waiting for confirmation from the tournament director, Kevin Varty from Nowra in NSW snared the major prize for the event. As well as a hefty cheque and an excellent sponsor prize pack, his two day aggregate bag weight of 4.03kg won him a place in the Hobie Kayak Bream Series Grand Final in Western Australia and a position on the Aussie team to compete in the Hobie Fishing World Championship in Europe commencing at the start of next month. Second place went to Brett Crowe from Vincentia in NSW who also won a grand final and worlds spot and Jason Meech from the Central Coast in NSW took the third place cheque and sponsor prize pack. Winner Kevin Varty has been tournament fishing for the past three years and competes solely in kayak fishing events. The round 13 tournament victory was his second tournament win. After his day one standing of 6th place and almost a kilogram behind the leader, his plan of attack for day two was simply one of, “more of the same”. Varty felt that there was no need to change what had worked for him on day one and the plan of sticking with a consistent approach brought him home with a win on one of his local waterways. “Today I just thought that I would follow the same plan I had on day one because I did pretty good yesterday. I was always going to stick to about 15′ of water and throw Zman grubz which was just the right combination for me on the first day. It was all pretty basic stuff but I just did the same again and it worked when there was no wind and grey sky yesterday and when there was a lot of wind and sun today. I just kept throwing grubs for most of both days and that’s all it took. I did get two good upgrades today though, while I was using an Ecogear Blade”. When asked what gave him the winning edge in the tournament Varty replied. “That’s simple, being consistent but mostly it was just the massive want to make the Aussie team to go to Amsterdam. The desire to be a part of that was the motivation, the winning edge, that’s all it was. Now I’m definitely going”. Brett Crowe competing in only his second Hobie Kayak Bream Series tournament netted a full bag of bream on day one but only brought home two fish on the second day of competition giving him an accumulated weight of 3.95kg, short of the tournament winner by a mere 35g and giving him an overall advantage in weight of 170g over the third place finisher Jason Meech. Crowe who sat in second position as he set off on the final day peppered the same couple of hundred metres from 7:30am, cycling through a number of soft plastics and at 11:25am he thought his chances of stepping on the podium were slipping away. Then he pulled out the old school Squidgy Dusk Lobby, it barely hit the bottom and Bang! A 1kg plus, bream. “On day one conditions were reasonably good and I had two fish by 8am. I found them on plastics in 12′ of water. To get the third fish I had to go searching and use my knowledge of The Basin and target areas I knew other people hadn’t been to. I got my third fish by 10:30 and quickly upgraded to just under a 1kg bream about ten minutes later and that put me in second place at the end of the first day. On day two I found the wind was a hinderence to me, some people like it, but I don’t. I had my first fish which went 1.18kg at 11:30am and I caught that on a dusk coloured Squiggy Lobby. At 12:30pm I got my second fish also on a dusk Lobby. Try as I might, I wasn’t able to get any more, but that big fish was enough to get me across the line and keep me in second place. Now I’m really looking forward to the opportunity and the challenge of fishing waters that are foreign to me in the Hobie Fishing World Championships in Amsterdam”. [/vc_column_text][vc_single_image image=”3265″ img_link_target=”_self” img_size=”full”][vc_column_text]Sydney angler and tournament 19th place getter, Jason Lambert, bagged the tournament’s biggest fish, a 45cm bream that weighed in at 1.61kg on the first day of the tournament. He happily took home the Hog’s Breath Cafe Boss Hog Big Bream cheque, winning it over other quality challengers who also came up to the scales with excellent sized fish. Lambert netted his winning bream at high tide, on a now very rare Pontoon 21 Crackjack 38 Shallow while very slow rolling along weedy flats around the western end in The Basin. On the strike he thought he’d hooked a big flathead as his Big Bream smashed the Crackjack which now has bite marks indents and scratches from the aggressive big fish. It’s time to start planning for the final round of the Hobie Kayak Bream Series which will be held at Paynesville in Victoria over the October 11-12 weekend with spots in the two day November 22-23 grand final in Mandurah, Western Australia up for grabs . A large field of 48 anglers pedaled off from the Power-Pole starting line on the first competition day of round 13 of the Hobie® Kayak Bream Series presented by Daiwa on St Georges Basin in NSW. Excellent conditions early improved further throughout the day until all kayaks were safely back on shore at the Atomic launch site. There were a good number of full bags of three legal bream brought back to the weigh-in, with a couple of real horses amongst them and one possible contender for the Hog’s Breath Cafe Big Bream Award. At the completion of day one weigh-in the competition is very close with, James Kilpatrick from Belmont in NSW is leading the field with a 2.92 kg bag, closely followed by a 2.24 kg bag brought in by Brett Crowe from NSW and Kane Terry from NSW whose 2.22 kg bag placed him in third position with a day to go in the event. On a day when big fish were hard to find in a waterway that produces a lot of excellent sized fish, Jason Lambert from North Ryde in Sydney is leading the Hog’s Breath Café Boss Hog Big Bream with the biggest fish of day, weighing in at a cracking at 1.61 kg. Tomorrow will be a highly competitive day on the water with first and second place finishers qualifying for the prestigious series grand final and also a position on the Australian team to compete in the Hobie Fishing World Championships presented by Rhino-Rack to be held in Amsterdam early next month. New strategies and tactics are being formulated after what was learnt on day one, the excitement is rising and sleep will be tough for some tonight. We’re heading for a great day on the water tomorrow. Monday 1st Sept to Friday 12th Sept. Note no prefish day. $100, ($140 on the day) Pre-entry via www.abt.org.au or on Sat 13th Sept. Palm Beach Reserve.